RED COWGIRL 456 is a large cow with exceptional pedigree. Her Sire KING COWBOY measures 83.5 TTT and 110.75 TH on 10/04/18!! He won a BRONZE at the HORN SHOWCASE! KING COWBOY is out of COWBOY CHEX. Her Dam is SHR PENELOPE who MEASURES 78.0 TTT and 99.75TH on 02/16/19. PENELOPES SIRE IS SUPER LEE who is out of SUPER BOWL!! 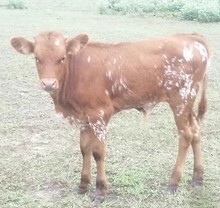 ***** RED COWGIRL is confirmed pregnant by blood draw to TRANSFORMER BCR ***** For a late spring baby! Check out TRANSFORMER BCR on our website. He comes from The Bull Creek Ranch and Bill and Suzanne Torkildsens breeding program. We feel that TRANSFORMER is something special!! Cowgirl has been in the pasture with our young bull, Transformer BCR. He is out of Rio Bravo ECR and Regarded Grace. His fantastic pedigree goes back to JP Rio Grand, Tari Graves, Star Regard, Peacemaker 44 and Don Julio. She has been in the pasture since late September.